Are you on the lookout for a golf rangefinder that can’t be easily forgotten? A rangefinder that won’t get left in the bottom of your golf bag? Then search no more! A Bushnell golf watch or handheld GPS may be what you need. 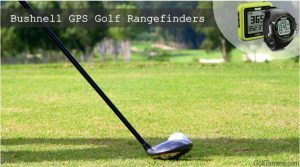 You’ve come to the right place if you’re ready to know all about owning an intelligent, functional, and even wearable golf GPS watch rangefinder. Bushnell is a well-known American company that “gets” sport optics. They understand it, they provide it, and they do it well. It only makes sense that they created a completely new company that’s dedicated to making your golf game the best game every single time. They take the best of their distance measuring technology and carry it into the invention of their golf GPS devices. Enter here – Bushnell Golf. Before you decide that Bushnell’s GPS devices are going to end up in the bottom of your golf bag with every other GPS device you’ve ever owned, think again. Easy and fast updates, long battery life, and no-hassle fees are just some of the shared features that the Ion2, Phantom and the Excel GPS rangefinder watch have in common. Although their outer-space technology fits into the palm of your hand, try to keep your feet on the ground as you discover all you need to know about this pocket-sized rangefinders and the best golf GPS watch available.